The product is said to be one of the best hair treatments with Moroccan Argan Oil. There are mixed opinions about it, though. The product has strong rebuilding and protective properties. It reduces the harmfulness of heat, increases shine and reinforces the hair. Moroccanoil Treatment Light is recommended for fair (also platinum and grey) and fine hair..
… are described by women all over the world in detail. The oil for fair and fine hair moisturises, smooths and adds shine after the first application. It speeds up blow-dry time and facilitates combing without overburdening. It is a weightless product, therefore it doesn’t make fine hair greasy. Your hairdo will be as manageable as it has never been before. … includes only a few ingredients, which can come as surprise to women who expect a richer formula for a high price. The product is composed of two natural plant substances – an oil and an extract. Silicones (quite lightweight), colourants, aromas and preservatives prevail in the cosmetic. For such a luxury and costly product, the composition is very poor. … smells nice. However, there is nothing special about the aroma; some women say it resembles men’s cologne water. It doesn’t have an intense colour. The oil is quite lightweight. If you apply too much, it may weigh the strands down. That is why, it is crucial to apply it in moderation. … are clearly explained on the product’s website. 1-2 pumps are enough for one application. You apply the oil to clean hair after washing and towel-drying, from mid-lengths. The cosmetic cannot be applied to the scalp, which seems obvious by looking at the ingredients. There is no need to wash it out. You can blow-dry or air-dry the hair. Moroccanoil also works when added to other hair products. … is a flattened and quite uncomfortable bottle made of dark glass which is supposed to secure the product from the unfavourable action of the sunlight. Sadly, it won’t work in this case: greasy oil and bottle that doesn’t fit the shape of your hand. It is easy to break. 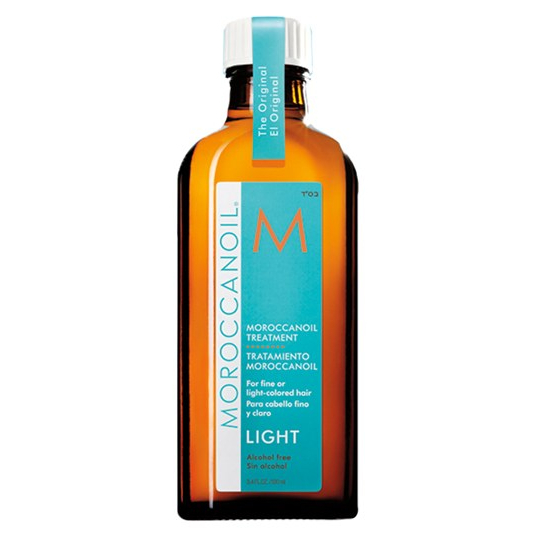 The standard capacity of Moroccanoil Treatment Light is 100 ml. It is also available in a 25 ml version. Both versions come with a pump that can be replaced with a cap. Unfortunately, the smaller bottle is not so comfortable to use. The perfection and effectiveness in the best version – Nanoil Hair Oil.